Undoubtedly, the qualifications of our writers are the key concern of our clients. You pay for professional research paper writing and you expect to get a well-written, properly-formatted and fully-referenced research paper that meets your requirements and is written in accordance to academic standards. We devote a lot of efforts, time, and sufficient funds to recruit and retain professional writers who are experienced, responsible and available 24/7 to provide writing assistance whenever you need it. What does it mean 'a professional writer'? A professional writer is the one who is responsive to your requests and does not neglect instruction points. Professional writer is the one who is fluent in English and is knowledgeable on your research area. Professional writer is the one who does not neglect your requirements and instructions. Our research paper writers hold degrees in diverse academic areas. Working with us, you get professional help of educated writers who have sufficient understanding of all aspects of your topic. As the result, you get a well-written research paper which meets your topic requirements and instructions. We keep the best writers and we pay them well to keep their motivation high. We pay special attention to the experience of our writers. We do not hire those people who do not have sufficient experience in academic writing. We recruit those writers who have at least 2 years of experience in academic research and writing. You pay your money for professional help and you deserve getting the best possible paper. Taking into account that more than 50% of orders we get are urgent, we have 18 writers working in office who are available to help you at any time of day and night. As the result, even the most urgent research papers are delivered without delay and meet your academic requirements. The responsible attitude means proper writing, timely feedback, and quick revision. 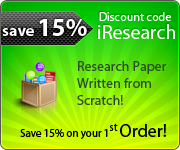 We guarantee non-disclosure of personal information of our clients and we do not resell delivered research papers. Moreover, we do not post delivered research papers online to attract the attention of potential clients. Our research paper writers respect you and your confidentiality. If you need additional information about our writers, their qualifications and research services they offer, do not hesitate to contact us. We appreciate your choice of our research paper writing services and we respect your rights and address your expectations!